What are New Brunswickers supporting when they pay their power bill? During the mine's rapid expansion, entire Afro-Colombian communities were displaced. Coal mining is usually a dirty business, but for Jose Julio Perez and the 700 other former residents of Tabaco, a small town in northern Colombia, it's downright bloody. The village was illegally destroyed to make way for the expansion of Cerrejon, the world's largest open-pit mine. Cerrejon supplies coal to NB Power, a Crown corporation that supplies electricity to New Brunswick. Perez gave talks across New Brunswick and Nova Scotia in March, calling for international solidarity. "I appreciate what you are doing tonight, trying to understand and feel our pain," Perez said to the 50 people gathered at one of his speaking engagements. "We feel international pressure will help us receive justice" he added. Approximately 16 per cent of NB Power's coal comes from Colombia's often-violent mining sector, most of which comes from Cerrejon. During the mine's rapid expansion, entire Afro-Colombian communities like Perez's were displaced; 350,000 Colombians were violently ousted in the first nine months of 2002 alone. Perez's presentation began with a short video from the eviction and eventual destruction of his town; heavily armed riot police bullied unarmed villagers while bulldozers smashed the town's church and school. Members of the media who were filming the event had their cameras broken by the army and were threatened. The camera panned to an interview with Perez, who stood in front of a destroyed home: concrete and corrugated iron lay in shambles as his son cried. 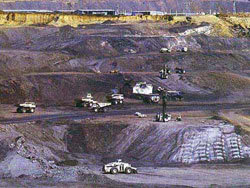 When the mine was expanding, owners offered some villagers trite compensation on the condition that they wouldn't try to negotiate collectively for relocation. Perez and many others refused the deal and demanded that they be moved collectively to a new town with all the amenities that Tabaco once had; Tabaco had boasted a school, telephone exchange, medical clinic and church before Cerrejon's bulldozers destroyed them. The demand for relocation has meant Perez and others have not received a penny in compensation. Perez and his family are now living with relatives in a nearby settlement. In 2002, Perez and his fellow villagers challenged their eviction in Colombia's Supreme Court. They won. The court issued a judicial decree ordering the relocation of the village. Four years later, the order hasn't been enforced and the townspeople are still living as refugees; their children are not in school. "The mine company has more power than the president," said Perez, citing corruption in the police and military as the primary reason the high court's order hasn't been enforced. Jim Brittain, a professor of political science at the University of New Brunswick, hopes that Perez's story will make New Brunswickers think about where they get their electricity. "People throughout the world are more socially, politically and economically connected than ever before," he said. Brittain is a member of the Atlantic Regional Solidarity Network (ARSN), the organization that is co-ordinating the 'blood-coal' campaign that brought Perez to the Maritimes. ARSN is demanding that NB Power pressure its Colombian suppliers to improve their human rights record. Perez and his supporters in New Brunswick met with NB Power officials, along with the provincial minister of energy, Brenda Fowlie. "They all stated that they were not aware of the issue until quite recently and welcomed the opportunity to discuss it with Jose Julio [Perez]," said Ramsay Hart, a member of ARSN who attended both meetings. "I think the personal connection that people made with [Perez] was also really important," Hart added. NB Power did not return phone calls or e-mails from The Dominion. Ninety per cent of Colombia's human rights violations are perpetrated in mining and petroleum exporting regions; 433 massacres in eight years, according to Amnesty International. In 2001 alone, Canadian corporations invested $869 million in the mining and petroleum sectors in Colombia. "There are coal mining co-operatives in Colombia that have good human rights records," says Francisco Ramirez, president of Colombia's National Mine Workers' Union, who has found common cause with Jose Julio Perez and other villagers displaced by the mines. "They [worker mining co-operatives] sell coal at the world market price, so I don't know why NB Power won't even consider switching, at least until the situation improves at Cerrejon," said Ramirez. Activists from New Brunswick are sending mock power bills to NB Power, showcasing the "real costs" of Colombian coal that include an "immeasurable human cost." They are also planning a conference in Colombia for August 9, which will take place near the mine and feature presentations for unions, displaced communities, local officials and other stakeholders.